I know there are some of you out there with Christmas birthdays. The advice given to us when our little girl was born on December 20th, 4 years ago…..was to never wrap her birthday presents in Christmas paper, or use holiday cupcake liners for her cupcakes, or to give her a gift and say it was for her birthday and Christmas. Ick. No fair. 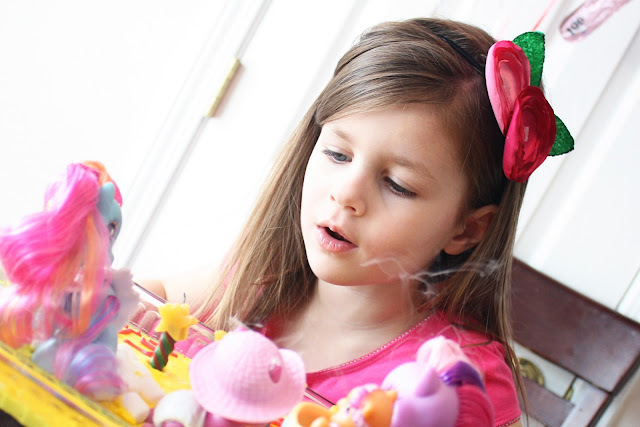 So even though the holidays are busy busy…….we tried to give our Little Miss a birthday-themed day. Without the Christmas colors, papers, songs, bows, etc. How did my sweet baby girl, so itty-bitty and full of plump, yummy, kissable cheeks……. …………turn into a big 4 year old, little lady? It’s okay, I still kiss on those yummy cheeks, though they’re not as full as they used to be. Happy Birthday to all of you Christmas-time birthdays! « Delicious and QUICK Holiday Treat….Yum! Very sweet pictures! We have a Christmas baby, too – he'll turn 3 on the 29th. I'm really hoping to make every birthday special for him! I have a Dec. 20 AND and Dec. 22 baby. Aaack. Not very good planning is it? AND we have 3 Nov. bdays. It's nonstop birthdays and parties from Halloween through Christmas around here. Yep, My daughter will be 6 tomorrow (Dec 28th) and I agree. I have tried to make her day special and separate from Christmas. I also moved her friend birthday party to January to make it easier to gather her friends who might be out of town on her actual birthday date. It seems to work and we have a fun time. I will let her choose when she gets older if/how she wants to celebrate actual birthday. Oh, your daughter is so beautiful!! What great pictures. My hubby was born on Dec. 23 and his mother always made sure to make his birthday special with no Christmas-related things and he still remembers that and how special it made him feel! my little girl turned 4 on the 22nd! we did a princess and the frog theme with no christmas at all! they were completely separate! Although, my new sister in law's birthday is christmas day! Happy birthday to your special Christmas Baby! My husband's birthday is at the beginning of Dec., and mine is the middle of Jan. Both of us our entire lives have had those "combined" presents. Him more than me…since people seem to forget how close to Christmas my birthday is until after the new year. He's said it bothered him when he was a kid, but as he got older he figured out it got him better presents. I really haven't ever minded, since I figured out right away it would get me better presents. Both my brother and I have birthdays in December, 17th and 19th! Has it happened… the combo present … yes… high five on making it her special day! Happy belated Birthday to your little princess! My hubby's b-day is on the 21st. His mom threw him a surprise pool party on his "half" birthday when he was a kid because they were always out of town on his real birthday so he didn't get to celebrate with friends. It was his favorite birthday year! I had a friend who's birthday was 12/24. He celebrated it every year in June, on his six-month birthday. You have THE most wonderful site. I love it and several weeks ago I saw a tutorial for making a ruffled shower curtain here – I think. I fell in love with it and want to make it, but now I cannot find the tutorial. I even looked under You made it, You love it. Can you please help me??? Our son has a January 3 birthday. Even then, we have to be so careful to make sure we have separate birthday presents and birthday celebration plans. Sometimes it is difficult with family coming in and out of town but it is so worth it. He'll be 12 next week, by the way. Time does fly by. I love her dress!..Did you make it? If so, can you do a tutorails? Thanks. My bday is the 27th Dec and when I was in grade and middle school my mom would let me pick when I wanted my friend party. One year it was spring, once in the summer etc. In high school I just had a new years eve/bday party w friends but that was my choice. I always got to open my bday presents (in bday paper) on my actual birthday. Now that I'm older and like more expensive things I use it to my advantage :)I thought my family handled it pretty well. 4 years sure makes a difference. She's so pretty. I too had a baby on Dec. 22nd. We always followed the rules given to you and the dining room was the only room in the house not decorated for Christmas…it was the birthday room. He loved it of course. Hmm I guess I am just diferent then most of you my birthday is on the 8th and I always liked getting bigger Birthday/Christmas gifts. and who doesn't want to make Christmas cookies on there birthday? You guys are right…..there are pros and cons. I completely agree! :) Thanks for all the new tips too! Happy birthday to your pretty girl! One of my girls has a Dec. birthday, although earlier in the month. We don't decorate for Christmas until after her birthday so she has a Christmas-free special day all her own. Our problem is actually being too close to Thanksgiving some years, so we've had her party in early-mid November sometimes and other times we've had it in December, but we've done a breakfast thing so everyone can still get to all of their Christmas parties and dance recitals and that sort of thing. It's tricky, but do-able. We had Dec 20th and Dec 27th babies. Another was born mid November, and my birthday is also in November. My husband's brother was born Christmas day and his sister on Dec 31st. So, December is crazy! We had a bit of a running joke at our house that our kids weren't allowed to date anyone with a birthday in December. Well my son (Dec 27) married a girl who's birthday is in December and then they had a baby girl December 18th….so I think we covered it! I actually forgot my daughter's 2nd birthday just due to the busyness of the season…I felt terrible but she sure didn't care. And yes…we're always broke this time of year! Good for you for still making it special. I try, but don't always succeed! My Christmas baby turned one on Christmas!! We made sure to wrap presents differently for Christmas and Birthdays :) I'm sure he won't care this year but definitely soon he will know the difference! Well I was born at 7:24 am EST on Christmas. I have had my up and down years. It is sure hard to wait a whole year to be appreciated. But now at least I have mother's day. One thing that I have learned is that I get to have my birthday presents under the Christmas tree and that is after all, special. My birthday is on Christmas Day! I love being ale to share my special day with such an amazing holiday. My family always separated it for me and I think that one of the reasons I love it so much. It is a very special time of the year. My little sister's birthday is today, so I know how you feel trying to keep the two seperate! Your family is gorgeous!! Aw Happy Birthday! I think I would go crazy with Dec b-days and Christmas. My oldest is an Oct baby and my middle is a Feb baby and that seems close to me :). You have a very beautiful girl! Its amazing how fast 4 years can go, Stan turned 4 in October I can't believe it. Good for you for making it special, my cousin is a Christmas day baby and I remember my mom making sure she kept it separate for him, for her sister.It was cute. Happy Birthday to your sweet little girl! My daughter turns 3 on the 28th so we too have a December birthday. My mom's birthday is the 26th so she taught me all the "rules" for celebrating Christmas birthdays. I was born December 26, and my dad was December 20. We usually had a joint birthday party after school was out, which I enjoyed. When I got older, it was hard to have parties because friends from school would already be out of town close to my actual birthday. We would usually try to do it before school was out for break. I really appreciate my parents trying to keep my birthday a special day! Your daughter is so photogenic!!! She's absolutely beautiful! Happy Belated Bday to her! Thanks for sharing. I have a Christmas baby too! we celebrated his birthday before Thanksgiving this year because the last couple of years his friends have all been out of town over the holidays, plus with the way everything lined up we'd have Thanksgiving, week off, Birthday, Christmas then New Years, birthday, birthday and then it would be over! I gave myself a break this year and had his birthday in early November. He was able to have a nice party with all of his friends, get gifts and it didn't seem like an overload to me spacing it out from Christmas. On his actual birthday we just took him out to dinner at the restaurant of his choice. I loved it! He liked it and we will be doing it again next year! Nice job. My birthday is 11/30 and my mom was very adamant about that too. Oh my! My little girl is 3 and I am just as shocked as you are at how big your little girl is! There is a big difference in 3 and 4, eh? Oh, and my birthday is 12/18, so I feel her pain. Birthday parties the week after Christmas or the first or second weekend in December worked out best for us. Have fun & Happy New Year! I think it's very important to differentiate birthdays from Christmas… my birthday is December 11th, two weeks before Christmas. I can't tell you how many "this is your birthday/Christmas" gifts I've received over the years. It sure makes you feel a bit less special when you're supposed to feel the most special. Your blog is simply marvelous. Happy 4th Birthday to your not so baby girl! My baby turned 5 on Christmas Eve. I remember telling God "I don't want to have her on Christmas Eve and miss Christmas Eve service at church." But she came out at 11:58am Dec 24th. But that year Christmas Day was a Sunday. So I insisted on being released from the hospital and I made it (with my little one) to church on Christmas Day. Funny! She really likes that her day is celebrated with wonderful songs that say her name…Joy Noel. We have 3 beautiful children, all born in the holiday season, December, January and February….they all get slightly jumbled in there; regardless of how hard you try. So, we started a Half-birthday tradition. Each year on the exact 6month day (ie: Dec 20th would be June 20th) that child gets a mini-birthday. They get to choose each meal and have one special dessert. No gifts, just a day to focus on that child and how amazing they are!! My bro in law is the 26th and we always do Christmas on the Eve with my husbands family and dont get together until the 26th and that's just to celebrate his birthday. Your girl is adorable!! Yeah I hated having my presents wrapped in Christmas paper too! But I do love to have them under the tree! Weird I know. What a little lady that little girl has become!!! I have a gift for you in my blog!! My birthday is ON Christmas and I always hated it. It was definitely the WORST when I got combined presents. Even my brother (who was born 4 years and 3 weeks later) got separate presents and it was not fair. Also, I always wanted a pool party and never got one because my birthday was in December. I am so glad to hear that you give your cute girlie a normal Birthday rather than a Christmas/Birthday. Me and my hubby have December birthdays and my parents always made sure I had a special birthday with nothing Christmasy involved. I think it is very important! I have friends who have dec birthday and their parents called them Birthmas days and celebrate Christmas and Birthdays together, AHHH! So not fair! My Christmas Eve "baby" just turned 21! He never has been ripped off for presents from anyone in the family. All the cousins think he has the best birthday because everyone is in a good mood awaiting Christmas. I love your tips! My son actually turned 9 this year – on Christmas day! He loves it because we celebrate Christmas with the grandparents on Christmas Eve, then Christmas Day is reserved for him. Everyone has been so careful – he gets double! He heard someone say he was a holy child and that he shares a birthday with Jesus, so he thinks that's pretty special, too. I think he's holy, but more like a typical, little boy, holy terror! All in all, we'll take those babies whenever we can get 'em! Such a sweet photo reel of the special day! My best friend just had a baby on December 13th. We also vowed to never splice the two special days. Each should have its own importance! Way to go! My little one turned 3 today… hubby and I have made a vow to not mix Christmas and birthdays for her… and to do something special, just the three of us, on her day. From my Christmas Day baby, who just turned two, thank you. It is hard to separate everything — twice as much work for us, really. But whatever it takes to make it extra special, right? i was born on thanksgiving and my birthday lands on thanksgiving day every seven years. ugh! everyone is too busy getting ready for the holidays to be worried about birthdays. My daughter just turned four also! Her birthday was the 13th so I can empathize with you. Your daughter is gorgeous. Glad she had a special day! Bless you! I'm 29 this year on the 29th of December and my mother was a saint about always having Christmas gone from our house before my birthday, and making a big stink over it, just like she would have in July. She'll love you for it when she's older and her friends are planning "New Years/birthday party's" and other relatives are giving combined gifts! Bah! My little Michele's birthday is on Dec 20 too!! She turned 2. Amazing how time just goes. Happy Birthday! Sweet pictures- Happy Birthday to your little girl. I was supposed to be due on Christmas Eve but arrived early have always been very glad for each and every of those days between Christmas and my Birthday. You got good advise… those pretty much cover my biggest Birthday/Christmas combo pet peeves! My birthday is December 9th and my baby girl's birthday is the 20th too. Sometimes December birthdays are cool because of double gifts but sometimes they are not because everybody leaves town. We follow the same rules; our son's birthday is the 19th. We try to have his birthday the weekend before Christmas so most people invited can make it, definitely use different wrapping paper, separate gifts (makes for a pretty messy house! ), cake and a theme of course. It's not their fault they were born so close to Christmas! My twins where born on the 26th and my older daughter's b-day is Jan. 13th, with x-mas it really is to much for us/them. What we've been doing for the last couple of years is having a X-mas in July B-day party. We've always had cold winter parties so the crew was thrilled to have so many new activities. They're only 4 now so I don't know how long we'll be able pull this off. Plus we do have a little party on their actual b-day, like cupcakes and 1 or 2 gifts. and I hate when people say, "we just bought them everything for christmas, there wasn't anything left to buy" AArrggg! I've heard that so many times I now respond with "then don't buy anything at all"
Oh, and a Happy Birthday to your beautiful daughter. My Bday is dec 24th, my parents were always good about celebrating. Couldn't have bday parties on that day. And we were always out of state or driving in the car out of state, which sucked. but it does feel special. I lucked out on the combined gift this year and got an iPad. my step-sister's bday is Jan 1st, so as adults, we always have a combined celebration at our family Christmas get together. What a beautiful little girl! What an exciting time of year for you all! My youngest daughter's birthday is December 20th and now she's had her own Christmas baby(Dec 18th). I was also given the same advise and have taken it! Very cute. :0) My brother was born on Christmas Day. We opened our Christmas gifts on Christmas Eve. Christmas morning we'd open whatever was in our stockings, and then the rest of the day was my brother's birthday. He was never shorted gift-wise; his birthday was the only one extended family could remember. She and I share the same birthday!!! I always have disliked the "Happy Birthday/Merry Christmas" Plus my brother's birthday is a week before mine so we usually shared…. I think it is great that y'all try to separate it so she has a day just for her! My two girls have April birthdays just one week apart. They are 8 months and 2 and a half. I am trying to figure out how to give them each their own day as they get older. Thank you for doing that for your daughter! I'm a Dec 29th baby and ALWAYS got one present for Christmas/birthday from family members. I told them it's not fair, they got a present in June and one in December, but it didn't matter. So glad you're doing that for her!! Your daughter is adorable! Happy belated to her! My birthday is Dec. 29th and I always thought I made out better gift wise because my mom would buy my gifts at all the after Christmas sales. Even if occasionally some of them were wrapped in used Christmas paper. My husband's birthday is Christmas day and my daughter turned four yesterday (27th). It is a challenge every year for me to make sure that each is celebrated and not lost in the holiday shuffle. Makes you realize how important it is to let people know how happy you are to have them and to find ways to make them smile all year long and not save it for one day. We stick to all those rules too. We actually had her open her gifts and blow out her candles on December 11th before we went to Sea World. On the 15th we took a Cinderella themed cupcake-cake to school. However, when I woke her up on December 24th and told her happy birthday she grinned at me and declared we were going to have cake. =( Nope! I'm not sure how to help her understand it's okay to celebrate early. She actually has half birthday parties. In November we went to a birthday party and learned the child's birthday was Dec 14th. That little girl didn't understand about parties coming early either; a month later she was asking us if we were going to her birthday party. My daughter was born on December 21, also four years ago. She arrived a few weeks early at a mere 4 lbs. We spent that first Christmas in the NICU surrounded by nurses, doctors and other new parents. It was both the scariest and happiest Christmas I've ever had. I remember sitting in the NICU when "Christmas Canon" came over the intercom. The entire NICU was silent as we listened to the song and held or touched our new little ones. 4 years later, my little girl is a happy, bubbly little girl. Like you, I vowed NEVER to associate her birthday with Christmas. Family sent us birthday presents for her wrapped in Christmas paper (ack!) and I quickly re-wrapped them in birthday paper. Happy birthday to your little lady and hooray for Christmas babies!! i have a granddaughter who turned two on dec. 19th. my daughter goes so far to not have a Christmas party. 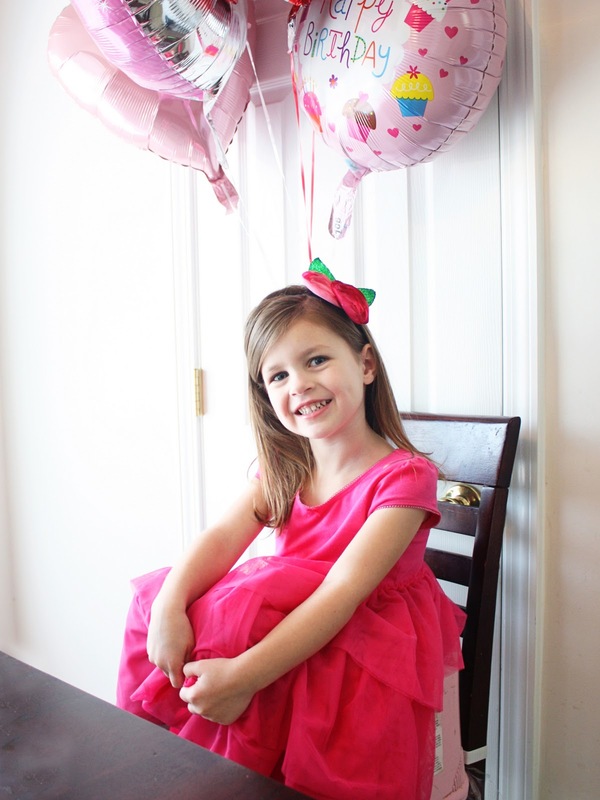 this year was a circus theme…..
My baby girl, Ava, was born on the same day as your little one. I can't believe that four years has flown by already! We are still in Rexburg, so we do her party early before the semester ends, so her friends are still in town. December turns into a month of presents for her, so I guess she can't complain too much! But I agree on the absolutely no Christmas wrapping paper or bunching the presents together. So lame! My birthday is in June and my parents combine Christmas/birthday :) Granted, the presents get more expensive at this point! My new baby sister Sarah was just born the day you posted this!! This is so perfect: thank you for sharing! And my birthday is the 28th of Nov. It is my daughters 1st birthday this week and we were given the same advice for celebrating her birthday! Her party is this weekend and I'm looking forward to it!! Your daughter is such a doll! My birthday is also on the 20th and my sister's was the 23rd. My parents always made sure to separate our birthdays from Christmas. When I was a teenagers I heard the following from my friends – "Sorry, I couldn't get you a birthday gift because I don't have money left after buying Christmas gifts" or "Here is your birthday/Christmas gift." As an adult, I love having a birthday at Christmas time because I love everything about Christmas. My cousin's birthday is right after Christmas and they have a tradition where they take off all the Christmas ornaments off the tree and make it a birthday tree by decorating it in streamers and birthday paper plates, hats, and such. She loves it because none of her siblings get a birthday tree. Our oldest was born on Christmas Eve! Although we can't escape the Christmas celebrations in the evening, we make the day time completely her birthday. Presents (without the Christmas paper like you said) and then we do an activity of her choice as a family. The last two years she has picked ice skating. And we constantly remind her how she is so lucky to have her birthday and Christmas and how she gets double the presents! We share the same birthday! Happy Birthday to your little one. I have gotten many a presents that were for Christmas and birthday…not my favorite. You guys are good parents to make sure not to do that. I have one on December 15th, and another on December 25th (that's right, ON Christmas!) I'm always looking for ideas! My birthday is New Years Day and my mom would take all the Christmas decorations off the tree and leave the lights on and put my birthday presents under the tree. I thought I was very special to have a birthday tree! The flowers your daughter is wearing in her hair, did you make those clips, or purchase them? they are very cute! My 2 year old was born on Christmas Eve. For me it's good because it means I have to be done with everything Christmasy by his birthday – because his birthday is a Christmas-free zone. We cover up the Christmas tree and refuse to mention the "C" word all day, until bedtime when we put out cookies for Santa. Everyone always feels sorry for him. But there is some seriously screwed-up stuff going on in DH's family every Christmas, and as far as I'm concerned, he's my excuse for life for avoiding that – so believe me, this kid is never going to want for *anything*! in any way, shape or form. My birthday is Dec 19th. of my childhood — my mother NEVER mixed the two special events in my life — birthday was birthday and Christmas was Christmas. Your little Miss is adorable and lucky to have you for a mom!! i have TWO boys born December 20th. I joke that I had twins, 7 years apart. It was a long tough labor! My oldest just turned 16 and the younger 9. We have ALWAYS kept Birthdays separate from Christmas. Gonna get a little tougher as the oldest keeps getting older and the "wish list" is gettint pricier! Fantastic! I have a little girl born right before Christmas and another baby born soon after. It is SO important for them to have a special day of their own. So enjoyed reading your post. i read somewhere of a family with all november and december birthdays, so they celebrate 'half birthdays' to give some room between celebrations. i thought that was a pretty clever idea. might try it even though my girls are april and september births. We have all November and December birthdays around here, starting with my daughter Nov. 16, then me on the 26th, my sister is Dec 7, my husband is Dec. 27 and my brother is Jan 3. It gets crazy but it is really important to separate them. My husband’s family never did, he would get a present for Christmas and get the batteries for his birthday. And my family used to give me and my sister one present, to share, for both Christmas and birthday (not my parents but aunts and uncles). It was not cool. My birthday is on Christmas Day, and honestly? If you raise your children to be appreciative and grateful, it really isn’t a problem! I have never cared if a gift was wrapped in birthday paper, Christmas paper, burlap or unwrapped! If someone bought me a gift, I thought it was great, and I appreciated it. The more of a production you make out of it is what makes the child turn it into an issue, or feel that it SHOULD be an issue. I do remember I always got my birthday gifts after dinner, and I had my birthday party with friends on the last day of school before the holidays, but honestly, I truly do not remember what my gifts were wrapped in….